There’s this great shop down the street from me. Last Saturday I popped in on my way back from a late brunch with a friend and a particular jacket in the window caught my fancy. The price seemed good, but something stopped me from getting it: there was an extra 10% charge for a “shelf display fee”, not shown on the price tag, which I had to add to the total price! 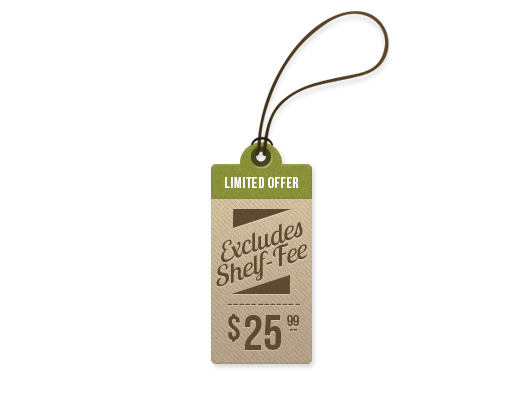 They explained that they’ve been having problems with shoplifting and that it costs them a lot of money to display items, so they started charging buyers for shelf space. I calmly put the jacket down, smiled at the shopkeeper and walked out. OK, the story is obviously fictional. One, I hardly ever buy clothes (and never on impulse) and two, no store in their right mind would charge a fee for something as silly (nay, vital) as shelf or window space. So why does it happen online? You see it all the time: an online seller showcases a product beautifully –glossy photos, a lengthy product description, glowing reviews– and then during checkout the buyer is greeted with a steep delivery fee, often a sizable portion of the actual product’s price. If the delivery fee gets too high, it usually results in a bounce, the customer simply leaves. When you buy a jacket in a bricks and mortar shop you don’t get charged a shelf fee, lighting and storage fee, shipping (from Bangladesh) fee, employee training fee or returns fee. Why not? Because retailers have long since learned that there’s more to business than buying something for a dollar and selling it for two. There are things that get built into the price: the likely percentage of sales that will be returned; how much stock will be lost through shoplifting, damage or general shrinkage; what it costs to insure, deliver and store items (per widget, if you must); what it costs to keep the lights running; what it cost to keep one item in the window (over another) and more. Smart online retailers bring more to the table than just a product and a price. It might be convenience, style, reassurance, care or more (or all of the above). Smart retailers might even take a loss (or vastly reduced profit) on certain, infrequent sales or they just cater to a smaller, profitable geographical location. 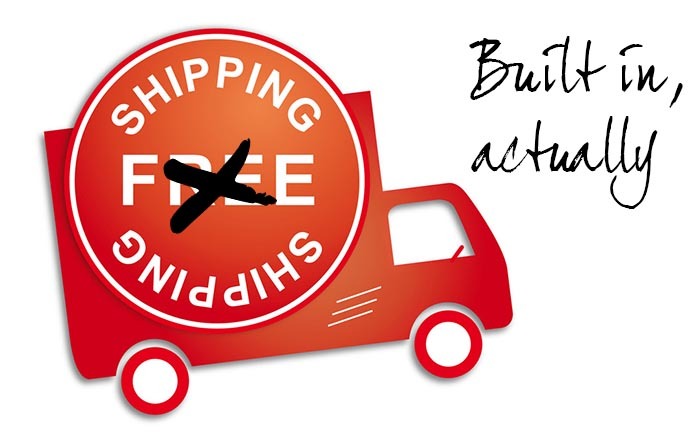 It they usually offer “free shipping”, which I’ll place between brackets since it isn’t free, it’s just built into the pricing model. As the annoying line goes: “Just call the courier or post office and ask them if they offer free shipping”. Of course I know that a seemingly easy answer such as “build it into your pricing model” can never answer all the complexities of your online business. Also why I dislike one-line solutions and slogans: there are just too many variables and things are generally more complex than a simple solution will make you believe. But I have seen the way buyers’ eyes light up when they see that there is “free shipping” on something they want to buy. It would be a shame not to give it to them, some way or another. I was wondering whether you could perhaps recommend any South African shipping options for woocommerce. I can’t find extensions or anything? What do most south african e-commerce guys use for international shipping? Any help you could provide would be awesome. It’s a bit tricky to give a recommendation not knowing the average weight, size and value of the packages. I know that a lot of people sending small things (arts & craft) overseas actually has great luck with the Post Office (they’ve cleaned up their act a lot in recent years). The most digitally integrated courier (with a big local and international presence) is Aramex. There’s a plugin for WooCommerce on CodeCanyon (http://codecanyon.net/item/shipping-details-plugin-for-woocommerce/2018867). They’ve got a very slick, automated system, but it only starts making sense using them above a certain threshold, since they are quite pricey. If you’ve got the labour (and easy access to your warehouse) to do thing manually, I’d say DHL/FedEx might be a good option (particularly since they calculate and include import taxes to prevent the items from being held up at customs). They’re also included in that plugin, it seems.